First edition. Chaucer is the central figure, but the study includes manuscripts, and the materials from which they were made, binding, and manuscript art. 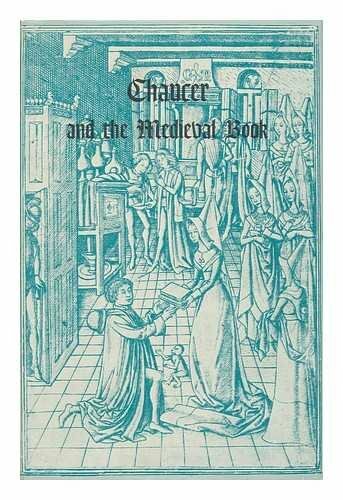 One chapter deals with the early printing of William Caxton, publisher of the first book printed in English and of many works of Chaucer the poet. xi, 165 pages. cloth, dust jacket.. tall 8vo..
MasterCard, Visa and checks accepted. Preferred domestic shipping via USPS is $5.95 for Priority Mail plus $2.00 for each additional book. The average delivery time for Priority Mail is 3 days. Larger books can be shipped domestically via Media Mail at $3.99 plus $2.00 for each additional book. For books weighing 4 lbs or under most orders can be shipped internationally via Global Priority mail for $35.99 All books are returnable within 10 days. Address: Fond du Lac, WI, U.S.A.